Operated by wireless remote control, Irci-Wash-Bot completely removes all traces of dirt, which accumulate over time due to atmospheric agents, smog and dust. All this, without damaging the photovoltaic cells, since the pressure exerted on the panels by Irci-Wash-Bot is approximately 2 psi and the brushes and wheels are not abrasive. Looking for panel wash equipment? Our new Irci-Wash-Bot is a remote controlled robot which is also twice as fast as anything on the market today! Irci-Wash-Bot has inverters on board which allow it to advance faster in less dirty areas. The machine will also slow down where the surface needs to be cleaned more thoroughly. Furthermore, The operator can rotate the brush faster or slower, depending on necessity. 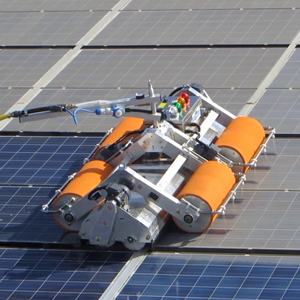 Irci-Wash-Bot is an irreplaceable tool for those who demand the maximum performance from their photovoltaic system. Thus, becoming an integral part of it. With an extra-wide 6’10” wash path, the Irci-Wash-Bot can wash up to 20,000 ft2 per hour. We make cost effective machines which wash faster, better, for half the price with a quarter of the water! So, we think you may also be interested on our Roboklin 25 model. Come be amazed! We designed Wash-Bot machines to make the job easier and faster. While using far less water, detergent, manpower and time than conventional vehicle washing methods. One person easily operate Irci Wash-Bots machine.